You’ve likely never heard of Heller. 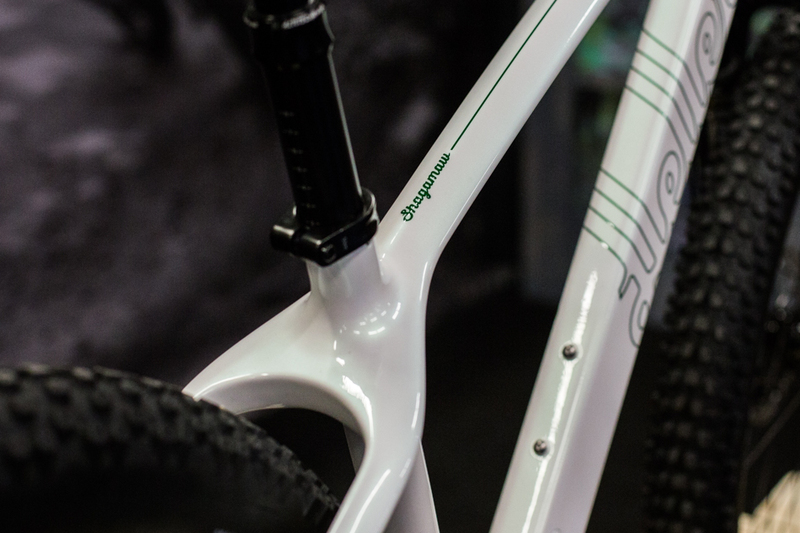 A new QBP brand, Heller Bikes debuted at last year’s Interbike with a $2,200 carbon fatbike. Intended to fill the gap between Surly’s spartan designs and Salsa’s more premium offerings, Heller is all about making modern, fun-to-ride bikes at realistic prices. Unless you’re from a logging town, you’ve also probably never heard of a Shagamaw–the namesake of Heller’s new plus-size hardtail. A fearsome beast, the Shagamaw was rumored to be part bear and part moose, with the upper body of the former and the lower of the latter. It was said to alternate sets of legs every 440 steps so as to make itself more difficult to track. It also, apparently, had a hunger for cloth–particularly cotton–but that’s neither here nor there. So why is this bike named after such a beast? The only connections we can draw are that, first, it’s made to wander in the woods; and second, that in a sense it can use either one of two sets of legs–in this case, 27.5+ or 29″ wheels. Hardtails have come a long way since the cross-country torture devices of yore, but it’s still a relief when a new one comes out with geometry that’s meant for having fun. And the Shagamaw is definitely intended for fun, with a head angle of 67.6, a 130-millimeter fork and 440-mil chainstays. The carbon frame features internal cable routing, a Boost 148 rear end, and, happily, a standard 73 millimeter threaded bottom bracket. Without an elevated chainstay, one-by chainring size on the Shagamaw is limited to 32 teeth, or 38 and 24 teeth for the large and small rings respectively if run with a front derailleur–the frame’s routing supports Shimano’s side swing models. There’s a bottle cage mount on the downtube, while the seat tube is lacking one. Claimed weight on a size medium frame is 2.87 pounds, and the complete “GX” build in the same size is claimed to ring in at 29 pounds–heavy for a hardtail, but not too shabby for a $2600 plus-size hardtail with a dropper post and beefy WTB rubber. The price-conscious GX build also includes a RockShox Yari fork, WTB Scraper rims and Bridger 27.5×3.0 tires, a Tranz-X dropper, TRP Slate brakes and a drivetrain potpourri of SRAM GX and Microshift. 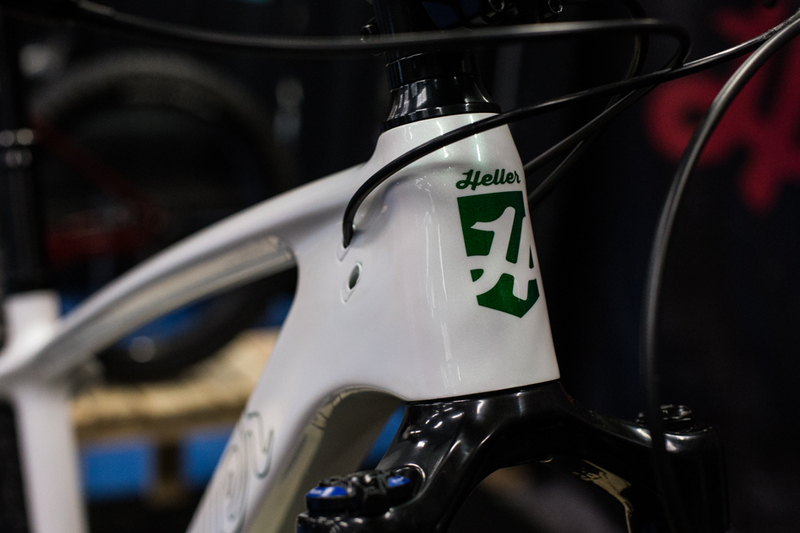 If you’re willing to sacrifice yet more component performance for a carbon-framed bike, Heller offers a “Deore” build for $2,000, and if you’re willing to sacrifice all component performance, the frame can be bought solo for $1,250. The Shagamaw is due to hit QBP dealers sometime late this spring. Cotton wearers beware. View our full gallery from the first day of Frostbike 2016.